Before moving in to our new house, we decided to refinish the hardwood floors. They were looking pretty well-loved and we knew that it would be infinitely easier to do the floors before we moved anything into the house. We both tend to be DIY minded people, plus we had a budget that pretty much ruled out hiring a professional. In the end the project was neither as easy nor as hard as we thought it would be, but we are definitely pleased with the results. Sorry about the before and after pictures that were taken at different times of the day, at different angles, and with different lenses. We're going with the flow here these days; I hope you can still get a feel for the much-improved-ness. 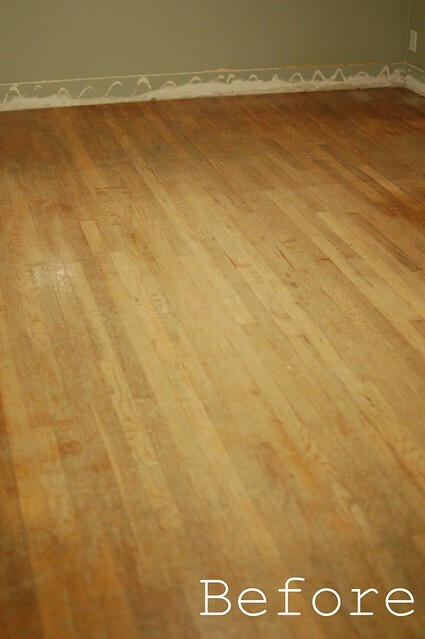 During the research phase of this project I became obsessed—for quite some time—with the idea of staining the floors. I wanted them to be dark. Mocha-ish, espresso-ish, it didn't really matter what dark beverage-ish they would be, I just knew that I wanted dark. In the end, we decided not to stain at all because of time constraints. Not because of the three men that tried to tell me that I didn't really want to stain my floor and why is it that whenever you say you want something different somebody tries to tell you that you actually just want what everybody else has? Anyway, I conducted a very scientific survey for myself where I treated a portion of the floor with stain + polyurethane and another portion with just the polyurethane. I decided that for the extra three days it might cut off our finishing time, I could live without stain. 1. 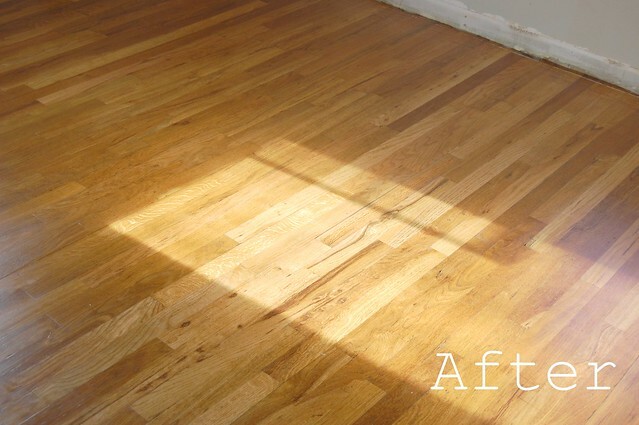 Decide to refinish your floors. 2. Conduct intense internet research via Google. Pay little to no attention to sites that say you should hire a professional. 3. Remove baseboard trim from all rooms that will be refinished. 4. Wonder if you actually should have removed baseboard trim. 5. Wonder where to put the trim while you refinish. 6. Cover all heating vents and doorways to rooms what will not be refinished with plastic to keep dust from getting in. 7. Obsess over stain color. 8. 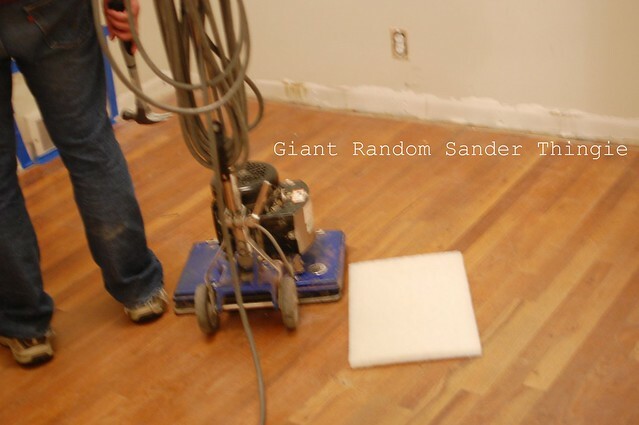 Rent a giant sander (not a drum sander or a belt sander, you want the random kind). 11. Realize that your random sander isn't going to take the old varnish off as nicely as you had hoped. 13. Decide to get quotes from professionals to do just the sanding. 14. Get quotes from 2 professionals. 15. Try to maintain polite attitude while they tell you that you're dumb for wanting to stain your floors. 16. Be completely shocked at the price of having your floor sanded by a professional. 20. Sand with a hand-held random orbital sander. 23. Sand on you hands and knees with a piece of sandpaper. 25. Sand to within an inch of your life. 29. Go over the floor with tack-cloth to pick up the dust that the vacuum missed. 33. Decide that you're okay with not staining the floor. 34. It is important to own this decision. 37. Wait at least four hours. 41. Wait at least two days before you move anything into the house. Waiting longer is even better, especially when it is cold. 42. Admire your new floors! 43. Try not to allow yourself to look too closely at some spots. 44. Notice a few spots where you didn't get all of the previous varnish off. 45. Kick yourself for not doing #25 more. 46. Put down an area rug. 47. Wonder when your house will stop smelling like poly. 48. Smile at your floor every time you walk on it. 49. Tell all of your friends that you did-it-yourself. 50. Pat yourself on the back. P.S. Don't forget to vote on the poll on my side bar if you haven't already! MIRANDA!! You lucky duck you! A room full of beautiful hard wood floors seems dreamy. So happy for you and your family. What fun! This looks like a huge job! I'm impressed with your fortitude. For the record, I would not have tried to talk you out of staining. But cutting 3 days out of the project is pretty huge. I wish we had hardwood! I LOVE your blog. This post is wonderful, and you make me laugh. Your floors look awesome!! Ok, I totally love your synopsis/tutorial. Perhaps I should do the same with my recent bathroom reno. Except it would be full of "educate self on how to install plumbing", "pull out your hair", "make another trip to the hardware store, grumbling all the way", "curse loudly" and "throw down tools and walk away until calm again". Also, the reason you that you were told that you didn't want to stain is because you asked MEN. And they were probably STRAIGHT. In my professional (I AM an interior designer, after all) opinion, they just hear that kind of stuff and think right away about how much work is involved and tell you not to bother. There is no hemming and hawing and "oh, yes, that would look lovely, you're right". They typically don't give a hoot about how stuff looks and just want things done quickly. So that they can go and watch the Junior World Cup Gold Medal Hockey Game. I can not tell you how many times I've had a couple sitting in front of me and the woman has a giNORmous (scrapbooks worth) wishlist for the house and all the guy asks me is: "Where does the TV go, where can I put my power tools, and how much is all of this going to cost me?" Next time, send ME a note. I'll give you the answers you REALLY want to hear. I agree with the above comment, you never should have asked a man. Of course the are going to say no way to the stain, all they can see is more work with the same result, cause the can't see the difference and they don't care. And yes, they all must have been straight. You just need a few hard working gay men around and maybe you could get things done the way you want. But then, you would also have to hang out with gay men, and that can also be a bit taxing. Hmmm. Conundrum. But I love the floors, even without the stain. Looks great, good work. And love your how to list, ahhh how I laughed. Love ya Mandy girl! This post totally made me giggle Miranda! Love your account of the whole process! I am desperate to rip up our carpets and put some solid hardwood floors down so I am super envious. PS: Adore the new header. They look great! Can't wait to see/hear more about your new house! Day-umn, that sounds painful. I am sooo proud of your tenacity! Beautiful work. Dare I ask: how many rooms did you do? what a huge project! it looks like tons of work, but definitely worth it! @Katharina, we did the living room, two bedrooms, and the tiny space in between those three rooms. Maybe 500 square feet? ish?